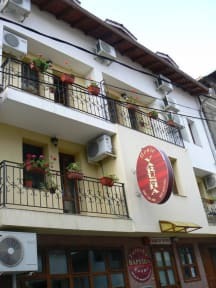 Hotel Varusha, Veliko Tarnovo, Bułgaria : Rezerwuj teraz! It is situated in the architectural complex 'Samovodska charshia' - the craft street. This street has preserved the charm and spirit of the period of National Revival. The hotel is located close to many famous landmarks in Veliko Tarnovo. The rooms provide all conveniences for pleasant and comfortable stay of our guests. They have individual bathroom and central heating. Further facilities at Hotel Varusha include a 24 hour front desk. Private parking is available on site, at an extra fee.